SEPTEMBER 19: The signing is official, Bill Oram of the Southern California News Group relays on Twitter. SEPTEMBER 18: The Lakers have reached an agreement with free agent center Andrew Bogut, agent David Bauman tells Shams Charania of The Vertical. 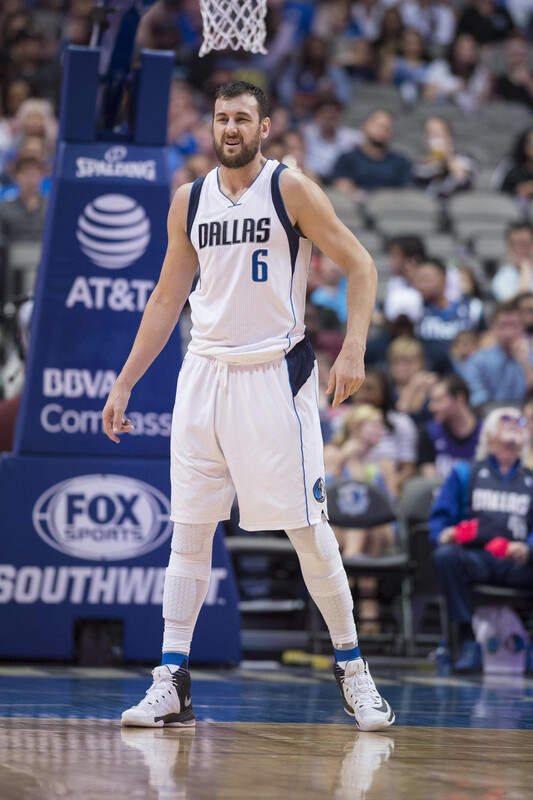 According to Charania, Bogut will sign a one-year contract with Los Angeles. David Aldridge of TNT adds (via Twitter) that the deal will be worth the veteran minimum, while ESPN’s Ramona Shelburne tweets that it’ll be partially guaranteed. 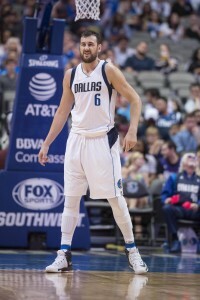 Bogut, who will turn 33 in November, began last season with the Mavericks, appearing in 26 games (21 starts) for Dallas before being traded to the Sixers in a deadline deal. He was subsequently bought out by Philadelphia and joined the Cavaliers as a free agent, but fractured his tibia in his first game with his new team, ending his season. Bauman suggested last week that a CT scan on Bogut’s tibia showed “complete healing,” with a radiology report showing that the center’s leg is “solidly united.” With a medical green light, Bogut was expected to find a new NBA home quickly, and ultimately landed with the Lakers, who will add him to a promising frontcourt that already features Brook Lopez, Julius Randle, Larry Nance Jr., Ivica Zubac, and rookies Kyle Kuzma and Thomas Bryant. Even if he’s fully healthy heading into the 2017/18 season, Bogut likely won’t make a major on-court impact at this point in his career — since the start of the 2012/13 season, he has been a role player, averaging 5.9 PPG in 23.5 minutes per contest. Still, he has provided reliable rim protecting and rebounding, chipping in 1.6 BPG and 8.2 RPG during that stretch, so he could have some value in L.A.’s rotation. According to Aldridge (via Twitter), the Timberwolves made a “major pitch” to Bogut, and the Celtics and Cavaliers were in the mix too. However, the former first overall pick liked L.A.’s “vibe,” not to mention the opportunity to reunite with head coach Luke Walton, who played a part in recruiting the ex-Warrior (Twitter link). While Boston was frequently linked to Bogut during his free agency, Adam Himmelsbach of The Boston Globe (Twitter link) suspects the Celtics didn’t push overly hard to land him. The Lakers entered the day with 19 players under contract, so their roster will be at the 20-man offseason maximum when they finalize their agreement with Bogut. Have a feeling Zubac might be packaged with Deng to help clear his contract during the offseason. Bogut will back up Lopez and they still have Thomas Bryant, Zubac didn’t look too improved either in the SL. But I was saying Lopez will be a free agent and if they trade Zubac they’ll only have Bryant since this a one year deal and Lopez will be a free agent. I can definitely see them packaging Randle with Deng and maybe even Clarkson since they are going after players like Lebron and Paul George and they have Nance and Ingram. They need one more center so I think the best bet is keep Zubac. Whatever the situation may be, the needa dump Deng. At first I wondered why would Bogut sign here. When is he going to play with all those other bigs? But I think everyone is right, the Lakers will be looking to trade Deng, and Lopez too, before the deadline. Could be going after Westbrook and LJ. Is there anyway possible they could pull a Miami, and sign all 3? Not if all three want the max/close to the max. One of the three (assuming the other player you didn’t mention is PG) would have to take well below the max and even that may not be enough. The Lakers have to move Deng’s deal before bringing in two guys at the max becomes a serious discussion. And with teams knowing the Lakers need to move Deng to add two big free agents, the Lakers are going to have to give up very valuable pieces with him (basically anything outside of Ball/Ingram should be in play in a package deal with Deng). In addition to that, the salary cap is starting to plateau so the amount of potential trade partners becomes limited. The Lakers could do a sign and trade to make the moves a little easier, but I doubt Cleveland wants Deng unless they get some really nice pieces back (as in Clarkson or future picks likely won’t be enough) and a double sign-and-trade for Westbrook and PG would probably gut the Lakers roster. Good signing magic we need a rim protector. Hopefully he can stay healthy. pollution, paparazzi, and traffic jams!! What is the over/under for games played this year? 25? In his mind he thinks he still can basketball, but his body will bring him back to reality real quick. Fake Bogut quote: “Lakers already have centers? Great! I’ll use this year to mend my bones on the beach. Wake me up when you sign all those FAs”. IDK how or why Brook Lopez gets traded. His $22.6 salary doesn’t fit under anyone’s cap so the Lakers would have to take on salary. Lopez is expiring so why bother? Lakers acquired him at some expense on purpose, to play him out in one year. BTW nobody is going to want Deng or Clarkson without something of positive financial value included. Randle is not it; he’s a FA in a year, available then if he developes his game. The next tradeable firstrounder is in 2020. I predict LAL will be starting George, Lopez, Deng, Pope and Ball for 2018/19. If James is in then him, George, Ball, Deng and a three-headed center like GSW. Maybe a 30% chance of James. You know what you’re absolutely right. So why sign Bogut? Can’t understand his thinking, or the Lakers. I thought he was on the Warriors last year?